Boston Market Sweet Potato Casserole has to be one of my favorite ways to make candied sweet potatoes. Now, if you don’t live near a Boston Market restaurant, you can either drive far or make your CopyKat recipe for these holiday favorites. Boston Market Sweet Potato Casserole has to be one of my favorite ways to make candied sweet potatoes. Now, if you don’t live near a Boston Market, you can either drive far or make this copykat recipe for this holiday favorite. In fact, with just a little bit of elbow grease, you can have a great-tasting sweet potato casserole any time of the year. 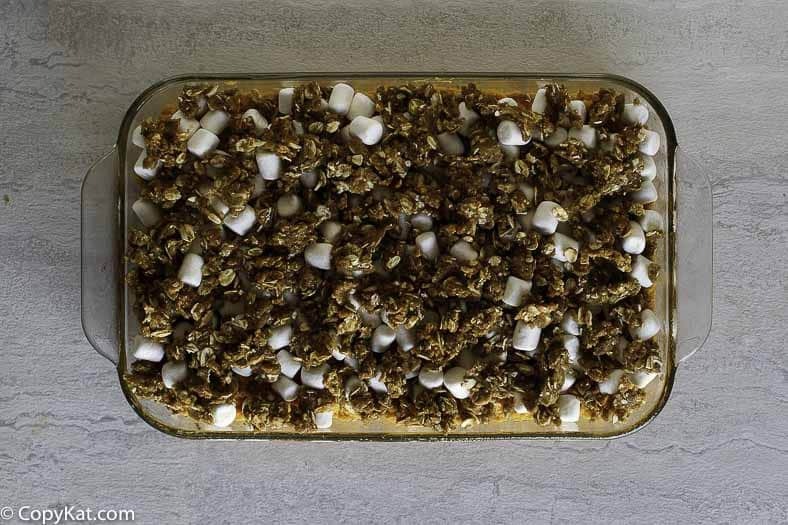 This recipe combines a thick oatmeal cookie-like crust, fluffy melted marshmallows, and a sweet and savory potato layer. Resisting this dish is tough. As everyone knows, Boston Market is not just in Boston – it’s a chain of “fast casual” stores that specializes in rotisserie chicken and other meat dishes, along with a choice of sides. However, the founders, Arthur Cores and Steven Kolow, did reside in Boston. Their concept was to provide food that was fresh and healthy but delivered quickly at prices closer to those of your typical fast food. In 1985, the founders opened the first store which was called the Boston Chicken store. The store was a huge success, the Boston Globe wrote it up, and the line stretched well outside the door. Following a couple of changes in ownership, by the end of 1992 there were 217 stores throughout the U.S., and in 1995 the name was changed to Boston Market to reflect the fact that the stores did not just sell chicken. The chain went through more ownership changes, and as of the beginning of 2018, there were approximately 450 Boston Markets spread over twenty-eight states. Read more about the history of Boston Market. If you want to make this ahead of time, I suggest you bake this fully and then reheat the 2nd day in the oven. The raw eggs in this dish make this undesirable to mix ahead 1 day and to bake the second day. Need more recipes for canned sweet potatoes? Check out these recipes. 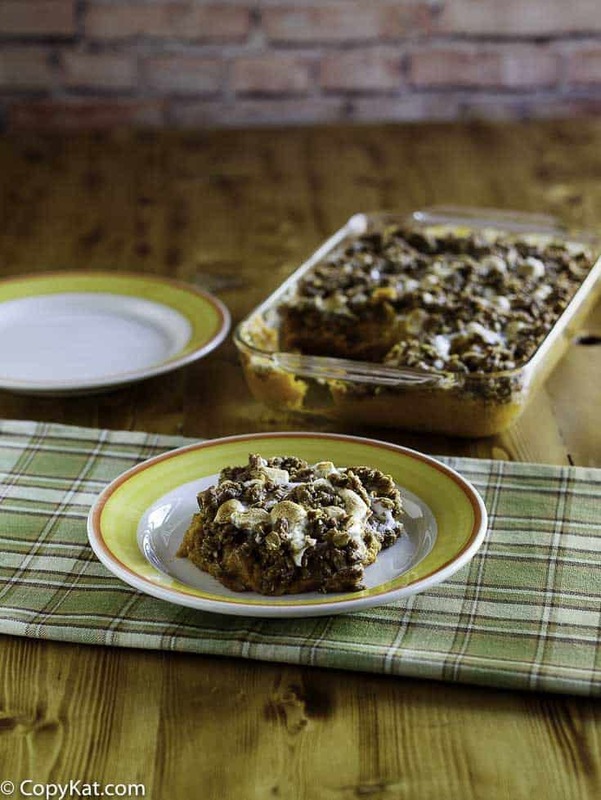 The Boston Market Sweet Potato Casserole tastes perfect any time of year. Wrap sweet potatoes in foil, place them on a baking sheet and bake for about 1 hour. After 1 hour, test by piercing with a fork; if you can pierce them easily, they are done baking. If not, bake them a little longer and test again. Allow the sweet potatoes to cool until you can handle them, remove foil, and remove skins by simply pushing off the skins from the flesh of the potato. Place the cooked potatoes into a large bowl. If using canned sweet potatoes, skip the baking. Just open the cans and drain off the syrup. Mash the sweet potatoes with the butter using a pastry blender or a potato masher until mostly smooth. Add the eggs, salt, cinnamon, vanilla, and nutmeg and beat until you have a uniform mixture. Add the brown sugar and cream and mix well. 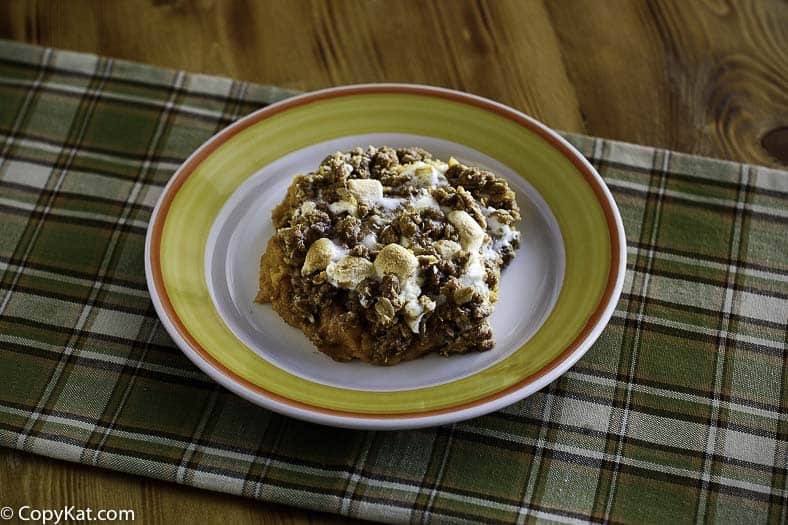 Oatmeal Cookie Crust Combine the flour, brown sugar, salt, oats, and cinnamon in a medium bowl and stir together well. Stir in the butter with a fork until you have a crumbly mixture. If you had turned off the oven, heat it again to 350 degrees F. Lightly coat a 9 x 13-inch baking pan with cooking spray. Spreading the sweet potatoes in the pan. Top with the marshmallows, then crumble the oatmeal crust on top of the marshmallows. Bake 30 to 45 minutes. I give this a 4.5 out of five. Delicious!! I used the canned sweet potatoes/yams so it came out a bit runny but did not affect the taste at all. Very easy to follow and a perfect replacement to the Boston Market side. Hi! I’ve made this many times and love it! But i started to have a sensitivity to eggs. Would it still work the same if I just omitted the eggs and still followed the rest of the recipe? I don’t think it will have the same texture, but it should be ok.
I’ve made sweet potatoes for over 20 years for thanksgiving and i never put eggs in it and it tastes delicious. i will be trying this recipe but still omit the eggs, so if i have any potatoes i can freeze them. I am sorry you dislike the taste of butter. You could try using margarine. I need to make this the night before and bake it before dinner… Can I refrigerate the crumb topping after I’ve mixed all the ingredients? Thanks for any advice. I am not certain of the results if you do this. Flour tends to change over a long refrigeratoration. Sure, this should work. You might just want to bake it, and reheat it. I made this for Thanksgiving. It was amazing! Everyone loved it. Even non sweet potato eaters loved it. It tastes better than Boston Markets. I’ve made this recipe quite a few times, and it’s always a big hit with everyone! Thanks for sharing it with us! I do have a question though, since I lost my recipe. When I looked up this one again, your recipe directions and ingredients say 4 Tbsp (1/2 stick) of butter with the potato mixture and 1 whole stick for the cookie topping, but in your comments and responses, you say 1/2 stick in the potato mixture and 1/2 stick in the crumble mixture, so I’m kind of confused of which way I should follow. I believe when I’ve made it in the past, I used 1/2 stick in the potatoes and 1 whole stick in the cookie topping, but now I’m questioning that. Can you please let us know which way is the right one and possibly update the right one? I’m going with the actual directions since that’s the way I think I made it in the past, but the other comments may confuse people. Thanks again for giving us this amazing recipe! Happy Thanksgiving! I noticed that too, I made it last week for an early thanksgiving gathering following the recipe, and it turned out great. I am making it again today using the 1 stick of butter in both the potatoes and the topping. I can’t see it hurting any. Please use the directions as written. It’s 4 tablespoons for the potatoes and a stick for the oatmeal cookie crumb topping. Hey I used half a stick of butter and then used cream cheese for the rest. No particular measurements, just by taste and texture. Kept adding. I added pumpkin spice too, just a little. I also used a little bit of granulated sugar, brown sugar was a tad bland for me. ✋Great recipe, I’m here for the holidays. Hello, I am from Quebec City. I don’t think we have oatmeal cookie crust ar the supermarket. What can I do to replace this ingredient? The ingredients listed under the cookie crust line are what you put in the crumble…see directions. Stephanie, this recipe is absolutely fabulous!! Every year I try to make sweet potato casserole and I’m never happy. My husband’s favorite is Boston Market’s SP casserole. So, I thought, I’ll just buy them. Cost was $80. No thanks. I made 1 1/2 times this recipe to feed the group. Everyone loved it. And best of all, my husband said it was better than Boston Market’s!!! Will make every year from here on out. Kudos to you!!! Thank you so much! Well I am glad I could help you make Thanksgiving cost a little less. I prepared this recipe and I have to say it was very delicious. It was very easy to make as well. I loved how easy the jackets came off after baking vs boiling the potatoes. I will be using this recipe every year because it is easy and delicious !